Collection of the Smithsonian National Museum of African American History and Culture. As the world prepares to mark the 100th anniversary of the end of World War I this November, the National Museum of African American History and Culture is shining a spotlight on the critical role played by the approximately 200,000 African Americans who served in Europe during the conflict, including roughly 42,000 of whom saw combat. One of the most renowned units of African American combat troops was the highly decorated 369th Infantry Regiment — best known as the “Harlem Hellfighters” — heroes whose stories, until recently, had largely been forgotten. But after being assigned to fight under the 16th Division of the French Army — because many white American soldiers refused to serve with black soldiers — they quickly proved their bravery and combat skills. Photograph of Lawrence McVey in uniform wearing the Croix de Guerre medal ca. 1920. See more. Collection of the Smithsonian National Museum of African American History and Culture, Gift of Gina R. McVey, granddaughter. The regiment was originally nicknamed the “Black Rattlers” for the rattlesnake insignia that adorned their uniforms, and they were called “Men of Bronze” by the French. It is believed that their German foes were the first to dub them “Hellfighters” for their courage and ferocity. In one engagement two of the most celebrated members of the unit, Private Henry Johnson and Private Needham Roberts, fought off an entire German patrol despite being severely wounded and out of ammunition. After Roberts became incapacitated, Johnson ultimately resorted to using his bolo knife. During the war, the Harlem Hellfighters spent more time in continuous combat than any other American unit of its size, with 191 days in the frontline trenches. They also suffered more losses than any other American regiment, with more than 1,400 total casualties. The extraordinary valor of the Harlem Hellfighters earned them fame in Europe and America, as newspapers recounted their remarkable feats. After the war, the French government awarded the coveted Croix de Guerre medal to 171 members of the regiment, as well as a Croix de Guerre citation to the unit as a whole. Certain members of the Harlem Hellfighters received a Distinguished Service Cross and other awards from the U.S. government. In 2015, Johnson received a Medal of Honor. World War I Croix de Guerre medal awarded to the 369th Infantry Regiment. See more. 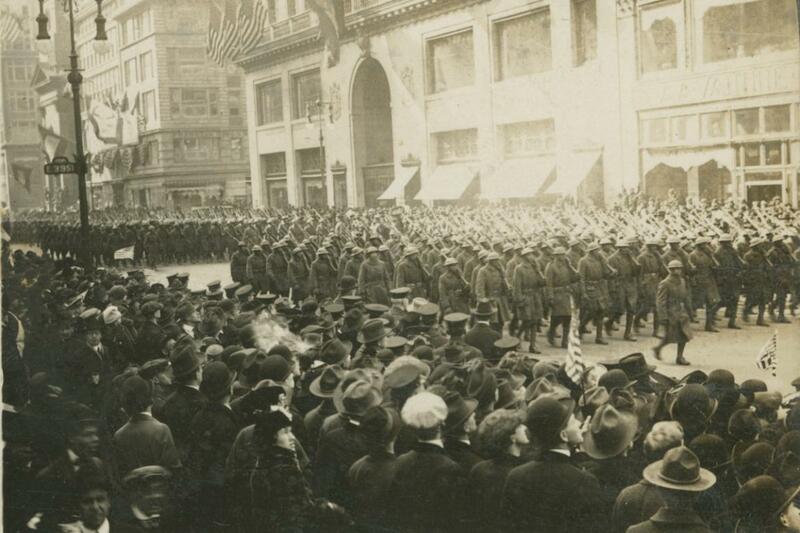 The Harlem Hellfighters were the first New York combat unit to return home, and the regiment, which had been denied a place in the farewell parade the prior year, was rewarded with a victory parade. On February 17, 1919, New Yorkers of every race turned out in huge numbers to cheer as 3,000 Harlem Hellfighters proudly marched up Manhattan’s Fifth Avenue to the music of their renowned regimental jazz bandleader, James Reese Europe. Stereograph of the homecoming parade for the Harlem Hellfighters, 1919. See more. Unfortunately, their fame quickly faded, and for nearly 100 years the remarkable story of the Harlem Hellfighters was largely erased from America’s national consciousness. With the opening of the National Museum of African American History and Culture, however, the courage and service of African American patriots like the Harlem Hellfighters is once again being recognized and celebrated. The Museum’s Double Victory: The African American Military Experience exhibition explores how the African Americans who served in the military since the American Revolution have not only defended our country, but also helped to lead the fight for equality and justice for the greater African American community. American Red Cross Photograph of Jim Europe's 369th Infantry Harlem Hellfighters Brass Band ca. 1918, Collection of the Smithsonian National Museum of African American History and Culture, 2011.57.39. 369th Infantry Regiment 1914 - 1918 Inter-Allied Victory medal awarded to Lawrence McVey, Collection of the Smithsonian National Museum of African American History and Culture, 2011.108.3. United States Army M15 Adrian steel helmet used by the 369th Infantry Regiment, Collection of the Smithsonian National Museum of African American History and Culture, 1918, 2014.131.2.